Web Data Extraction Software – DataCrops is a web extraction platform that assists in taking strategic and competitive business decisions through data collection & analytical insights for any Organization. It is built from our vast technical expertise and experience delivering meaningful business data to over 1,000 companies throughout the world, encompassing a wide variety of applications. DataCrops is committed to providing our clients the most cost effective, timely data extraction and analysis solutions through our well defined product development and project management processes. Competitive and strategic information need is substantially growing in the global business scenario. Authentic information sources are immensely useful in analyzing business strategies, service offerings and product specifications for any Industry. Many organizations collect and store large amounts of data from their business operations. To sort through that mountain of information and make it usable, businesses are moving away from the limited versatility of simple spreadsheets and relational databases towards an integrated Data platform. Data Intelligence tools allow you to see relevant patterns, trends and relationships within huge volumes of data, thus providing clarity when making decisions. Data Intelligence proves particularly helpful with market research, product/service analysis, brand, channel & price monitoring, competitor tracking, customer demographics research, business support and sales profitability. The measured analytics needed include product performance, service reviews, competitor’s pricing, social media visibility, market trends and tracking overall business reach. The required data is extracted from various websites and data sources manually which is time consuming, error-prone and affects core competency. 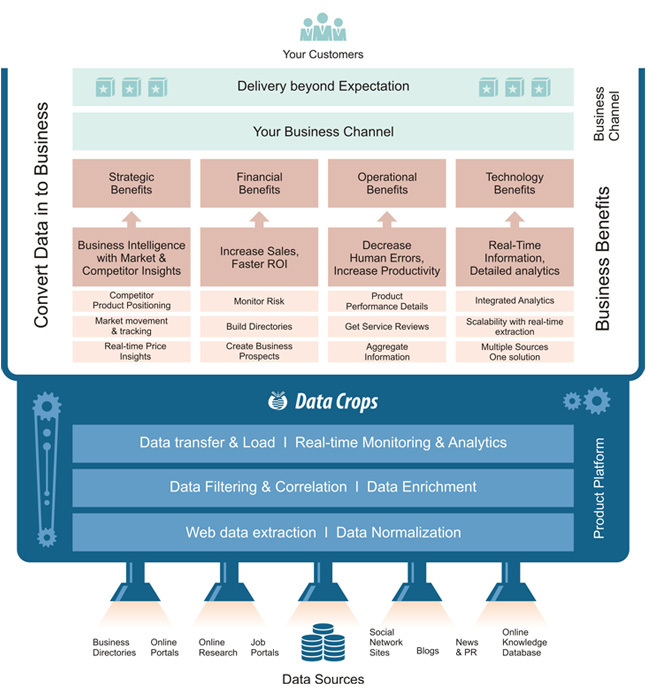 DataCrops with advanced web data extraction and data processing technology platform helps businesses easily automate these activities with 100% accuracy, faster pace and without human errors. It intelligently extracts information using a self-enhanced technology that can automatically login into multiple websites and complex data sources. It extracts data, transform and load it – ensuring the delivery of right information at the right time and in the right format. DataCrops allows organizations to make better decisions faster, convert data into information, and use a relational approach to management. It helps you leverage the experience and objectivity of an impartial expert who will analyze your online data requirements with the goal of increasing organizational efficacy. The primary focus of all Data Intelligence projects aims to fill the analysis gap and convert raw data into usable business information. Customers today use the Internet and smart phones to dictate the prices they are willing to pay for products and services as well as to publicize their opinions online for the same. The same online channel which empowers consumers can even assist you to regain control and the competitive edge in the online marketplace. DataCrops with its extensive set of data extraction tools supports this entities to have financial data and analytics extending their business arms. The purpose here is to build multiple but filtered knowledge pools for particular products/services/area of interests with consistent brand building and reputation management.